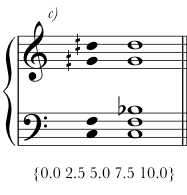 Example 4.2a transcribes Ives's secondary sonority; I refer to this chord as the "B-chord" in my dissertation. 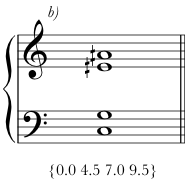 Example 4.2b is a third sonority described by Ives in Some Quarter-Tone Impressions as a "nine-five-five" chord. I'm confident that Ives was indicating quarter-tone intervals built up from the root; in the previous sentence, he explicitly mentions the interval of five quarter tones. I call this chord the "C-chord" and it does appear in the opening of the chorale. 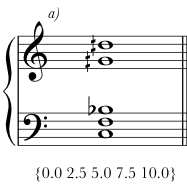 In Example 4.2c, I've transposed the C-chord to a root of F-natural and rearranged the chord voices to show that the C-chord is a four-note subset of the B-chord.